Tula is an industrial city and the administrative center of Tula Oblast, Russia. It is located 193 kilometers (120 mi) south of Moscow, on the Upa River. The city has existed since at least the 14th century; the name is of pre-Russian, probably Baltic, origin. 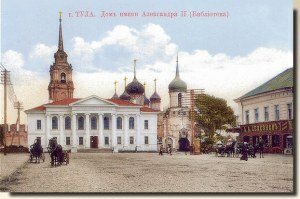 In the Middle Ages, Tula was a minor fortress at the border of the Principality of Ryazan. As soon as it passed to Muscovy, a brick citadel, or kremlin, was constructed in 1530. It was a key fortress of the Great Abatis Belt and successfully resisted a siege by the Tatarsin 1552. In 1607, Ivan Bolotnikov and his supporters seized the citadel and withstood a 4-months siege by the tsar's army. In the 18th century some parts of the kremlin walls were demolished. Despite its archaic appearance, the 5-domed Assumption Cathedral in the kremlin was built as late as 1764.